Share The World’s Resources (STWR) have released a book version of the pioneering work by Mohammed Mesbahi, which proposes a ‘people’s strategy for world transformation’ based on a massive mobilisation of civil society to end hunger and life-threatening poverty as an overriding international priority. Mesbahi argues that meeting the basic requirements outlined in Article 25 of the Universal Declaration for Human Rights—concerning adequate food, housing, healthcare and social security for all—has profound implications for the future direction of international relations and global development. 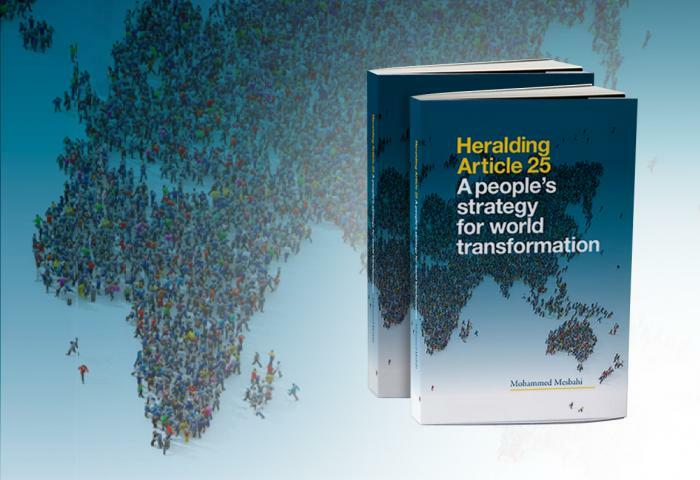 With a unique and holistic analysis of humanity’s problems, the book centres on a theme that has been raised in several of Mesbahi’s past publications: for activists and ordinary people of goodwill to adopt Article 25 as their protest slogan, goal and vision. Acknowledging the many objections or cross-questions that are likely to arise from this simple proposition, Mesbahi examines at length the significance of mobilising public opinion towards the urgent goal of ending poverty in a world of plenty. In five separate but interrelated parts, his latest compilation of studies guide the reader to investigate the question of world transformation from psychological, moral and spiritual perspectives, as well as from a broader political and economic analysis. As Mesbahi elucidates, we ultimately need a new education that can equip the citizens of every nation to think in terms of the one Humanity, with a universal understanding that the principles of sharing and cooperation are the foundations of a sustainable global economic system. The book is published in the UK by Troubadour publications and is available in paperback, hardback and e-book versions from retailers worldwide, including Amazon. A German version of the book is also available in paperback here. Mohammed Mesbahi is an author, political activist and founder of Share The World’s Resources (STWR), an independent civil society organisation based in London, UK, with consultative status at the Economic and Social Council of the United Nations. STWR is an independent civil society organisation campaigning for a fairer sharing of wealth, power and resources within and between nations. Through our research and activities, we make a case for implementing a global process of economic sharing as a pragmatic solution to a broad range of interconnected crises that governments are currently failing to address – including hunger, poverty, climate change, environmental destruction and conflict over the world’s natural resources. To buy the book in paperback, hardback or as an e-book, visit Troubadour, or Amazonor other retail outlets.